We all know the struggle is real when it comes to frying anything. Not only does food sticking to the bottom mean it tends to burn, but it can also make cleaning a living hell. However with the best non-stick pans, you can improve your meals and reduce the effort involved in cleaning up afterwards. We've gathered the best non-stick frying and sauté pans for your convenience. You can thank us later when you're enjoying your scrambled eggs without having to leave the pan soaking in hot water and bicarbonate of soda. Our list rounds up the best for all budgets and levels of expertise. They're all robustly constructed, usually with the non-stick applied to aluminium or stainless steel, with comfortable, oven-safe handles. You probably have questions about non-stick pans. Here, let us answer them? • Are non-stick pans dishwasher proof? Most non-stick pans claim to be dishwasher proof, but then add that years of dishwasher cleaning will adversely effect them. So in other words, NO they are not, if you really want to ever take advantage of that 10-year, 20-year or lifetime guarantee that many come with. On the other hand, if you're happy with 5-10 years of use and prefer the convenience of dishwashing, go ahead. Most are, so long as the handle isn't made of non-oven-proof plastic. Each pan's packaging will usually detail what the maximum oven temperature you can get away with is. • How can I make non-stick pans last longer? Simple: don't clean them in a dishwasher, and don't subject them to extreme heat – ie: above 180º in the oven, or on your hottest burner at full whack. That's true whether you're using induction, gas or ceramic. Non-stick pans are really designed for use on low to moderate heat. The best ones conduct heat so well that this is all they need. You can turn the heat right up for short periods to sear meat, but for maximum longevity, don't do this for more than a minute or so. Use a cast iron pan instead if you're into ultra-manly, mega-heat-based cooking. A happy side effect of cooking on a slightly lower heat is that cleaning is much easier, so you can do it by hand. With more expensive pans you can practically get away with a quick wipe with a tea towel after some meals. Oh, and for god's sake, don't turn up the burner so flame (or the edges of a halogen hob) extend beyond the base of the pan. That's like farting in a lift. With an induction hob, you can't heat beyond the edge of a pan, so they're fully safe in that respect. Like most things Le Creuset, this pan pays back its cost with years of delicious food and hassle-free clean-up. Made of hard-anodised stainless steel, this pan is ridiculously tough yet easy to handle. It heats up rapidly and evenly and cooks up a storm without you needing to whack the hob up to 11. It is compatible with all hobs, including induction, and oven-proof too. Its stainless steel handle stays surprisingly cool, although not if you put it in the oven, of course – use a glove. As usual with this type of pan, Le Creuset says it's dishwasher safe but then, er… advises you not to put it in the dishwasher. However, with a thick coating of non-stick, it's a cinch to rinse and wipe clean. We've been using this pan for years now, and it's still almost as good as new. A sauté pan like this excellent 24cm forged aluminium offering from US giant Circulon cooks and fries just like a shallow frying pan, but it's higher sides and lid mean you can shake it back and forth more vigorously without ingredients spilling over the edge. Consequently, it’s perfect for everything from sauces and searing meats to sautéing (stir-frying) vegetables. It's also a a handy shape for scooping out small runaway ingredients like mini vine tomatoes and fried chorizo pieces. Part of the Ultimum range, this one is constructed with three layers of premium non-stick coating while the reinforced steel base ensures even, speedy cooking. It’s dishwasher safe, oven safe up to a commendable 260ºC and induction hob compatible, too. This eco-friendly fryer from GreenPan is a good all-rounder. Its Thermolon coating means that this pan is free from lead, cadmium and other chemicals that you may be concerned about. It still keeps its hard-anodised base and wipe-clean finish inside and out, and it’s suitable for all hob types. Robert Welch produces some of the most elegant kitchen equipment on the market and this superb 24cm skillet is a case in point. Constructed entirely from high quality mirror-like stainless steel – the base is a three-ply mix of copper and stainless steel – the heavyweight Campden transfers and retains heat exceedingly well, which means you can fry stuff at much lower temperatures. This mid-priced 25cm French skillet (that's another word for 'deep frying pan') is just the right size for a pair of almond-crusted Gressingham duck breasts or a decent serving of sautéd veg. It’s quite a looker too, with its dark bronze pigment and comfy SureGrip rubber wood-effect handle. The shell of the Advanced+ is made from hard-anodized aluminium coated in metal utensil-safe nonstick Teflon while the sturdy stainless steel base ensures suitability for all hobs, including induction. It’ll also happily handle oven temperatures of up to 200˚C. This is an efficient, keenly priced option that heats quickly and is just the right size for smaller hobs. A bargain, no less. If you’re a fan of flipping pancakes, then this is the frying pan for you. A clever combo of steel and aluminium means that the Scanpan feels impressively heavy duty, yet light as a feather to handle. Its special ‘stay cool’ stainless steel handle looks stylish, but won’t singe your hands and you can use any utensil with it, even those made of metal. It boasts a GreenTek coating, meaning this one is also free from chemicals. If you struggle with broken yolks and uneven egg whites, then the Tefal One Egg Wonder will change your life! Whether you like them sunny side up or over easy, this non-stick miniature pan can make the perfect egg in minutes. It’s surprisingly versatile, too. You can start your cooking on the hob and finish in the oven, up to 180 degrees celsius, and if treated well, the non-stick coating is protected by a lifetime guarantee. If you like the Le Creuset but don’t want to pay that much for a frying pan, then the Tefal Expertise Frying Pan is a fantastic alternative that won’t break the bank. This is one of the best non stick frying pans for everyday use because it is extremely durable and praised for its ‘Titanium Excellence’. It’s a popular choice of pan due to its Thermospot technology which tells you when your pan is at the optimum temperature for cooking. If you think that all non-stick frying pans look the same, then this one will brighten up your kitchen in an instant. 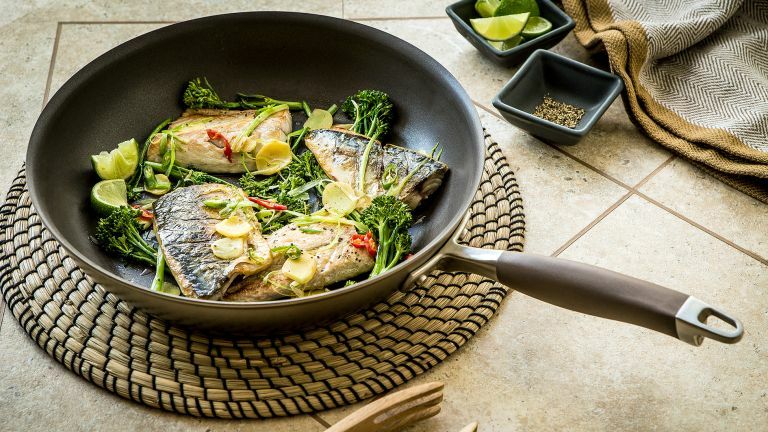 Not all about colour though, this is yet another chemical-free non-stick frying pan that is leading the way in more environmentally friendly cooking. So, if you’re an eco-warrior but can’t afford the ScanPan or GreenPan, this is the one to get. Plus, its high-quality anodised aluminium construction reduces risk of hot spots, meaning you get a truly even cook. Our final choice, the Tower Cerasure Colour Change Fry Pan, shares the Tefal Expertise’s colour-changing technology for optimum safety when cooking. So if you like the idea of the Thermospot Technology but the Tefal was just out of your price range, this one comes in at a more reasonable price and we highly recommend it. The largest pan is great for those man-sized portions whereas the smaller pan is perfect for students to practice foolproof frying.